Early rumors and leaks had us excited for a few new drones from DJI in mid-2018. DJI delivered some solid gear with the Mavic 2 Pro and Mavic 2 Zoom in August, but what of the rest of it? 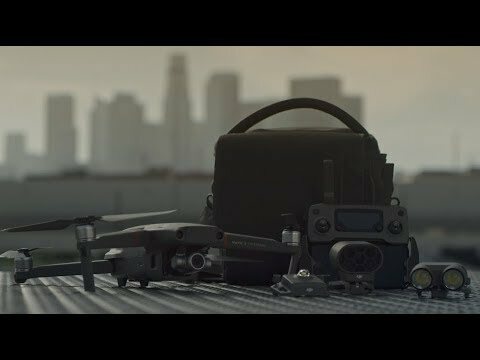 DJI has announced the Mavic 2 Enterprise. This is a familiar looking machine, in-fact, it has just one obvious structural difference from the default Mavic 2 Zoom, a mount on top for some new accessories. It should be no surprise to the tech savvy these days that hardware is important, but software is what makes the difference between good and great. The DJI Mavic 2 Enterprise, on first inspection, appears to prove this point. We are obvious fans of the DJI Mavic 2 Pro and the DJI Mavic 2 Zoom. Fact is, they are practically the same drone. They both have the same folding airframe, same flight hardware and nearly the same flight features. The main difference? The Mavic 2 Pro has a 1-inch Hasselblad camera, the Mavic 2 Zoom has a 1/2.3-inch camera with 2x optical zoom lens. Once familiar with these two consumer drones, it makes it very easy to explain the new Mavic 2 Enterprise: Take the Mavic 2 Zoom, add 3x digital zoom to the camera, some software and an accessory mount on top. That about sums it up. Visually, you can tell them apart by the colored stripe on the front propeller arms and by the slot on top of accessories. The consumer Mavic 2 drones have a silver stripe, the Enterprise has a red stripe. Otherwise, the name emblazoned on the front arm is a dead giveaway. Keeping it short, the Mavic 2 Enterprise is a folding drone, as with the consumer models, it packs 31 minutes of flight time, 5 mile range, all-direction obstacle avoidance sensors, 4K video recording and OcuSync 2.0 for advanced connectivity. In terms of hardware, the biggest new features are a self-heating battery, for those cold weather flights, and an ADS-B receiver. Sort of. There’s also the accessories. Can you believe we haven’t told you what they are yet? How long is this article?!?! DJI AirSense is built into the Mavic 2 Enterprise. This is a receiver for ADS-B signals. That is a standard aircraft announcement system used by many manned airplanes around the globe. Collecting this data, you can see in real-time what air traffic is in your area. Remember, it is your responsibility to get out of the way of manned craft, which is much easier when you know exactly where those flying machines are at. A couple other exciting upgrades see 24GB of internal storage, up from 8GB on the consumer models, and password protection. The storage and flight data can be password protected to ensure the safety of your private data if your drone lands in the wrong hands. Folks at home may not be concerned with this, but sensitive companies and government requirements may need this. DJI is also allowing a more offline experience with the Mavic 2 Enterprise, should you need it. This is again to protect your data and, when needed, to hide your operation area. Now for the accessories. The Mavic 2 Enterprise can accept a number of mounted tools just above the nose of the craft. You get a flashlight, a speaker and a strobe light. Each way more impressive than their name. M2E Spotlight: With two spotlights side-by-side, this light puts out a rated 2,400 lumens. That’s roughly the same as the high beams on a car. M2E Speaker: I dreamed of a floating Bluetooth speaker for my music, but that’s not the idea, you can pre-record ten voice recordings and play them back. Rated at 100 Db volume, this is perfect for search and rescue operations, or telling those kids to get off your lawn. M2E Beacon: Made to help with night flights, the strobe light is rated for at least three miles of visibility. This is a multi-directional flashing strobe. Please note, you can only use one accessory at a time, and they run off of the drone’s battery. Their added weight makes a difference, the drone alone can get up to 31 minutes, simply installing each accessory drops that to about 26 minutes and running them can bring you down to as low as 22 minutes with the spotlight at full blast. Connecting to the Mavic 2 Enterprise is done with a normal Mavic 2 series controller, but you will install a new app on your phone this time. DJI Pilot is the new app, designed specifically for the Enterprise, so to work with the new accessories and flight safety systems. You can also tie into your existing DJI FlightHub systems. Considering the advanced accessories and enhanced flight features, we expected a substantial price tag. That said, being nearly the same airframe as the consumer class Mavic 2 drones, maybe we shouldn’t be surprised over the relatively affordable price tag of $1999. Like the other Mavic 2 machines, you can purchase a Mavic 2 Enterprise Fly More Kit to get extra batteries, extra charging options, some propellers, a bag and more. What do you think, can the new Mavic 2 Enterprise handle some of your tasks at home?